Palberta’s video for Bye Bye Berta highlight “She Feels That Way” is set in a world rendered from refuse. In its opening shot, a pterodactyl with the texture of hand-me-downs drifts across an artificial sky. Atop it, three puppet versions of the members of Palberta are nestled together in a row, in the soft hues of a faded cloth bouquet. When they first appear, Lily, Ani and Nina look like the handmaid playthings of a pre-manufacturing America. The pterodactyl ultimately lands in a drab apartment with chipping paint that evokes the DIY spaces where they’ve thrived. Palberta’s music has always evoked both something primal and innocent but their self-directed video has obliterated the separation between pre-school and the prehistoric. Before the video’s end, Palberta appears in the flesh, rupturing another boundary between artifice and reality. Although they’ve collaborated with a lot of artists in their community to make their records, the most distinctive and defining aspect of Palberta’s work is that it sounds like the product of Lily, Ani and Nina’s collaboration. 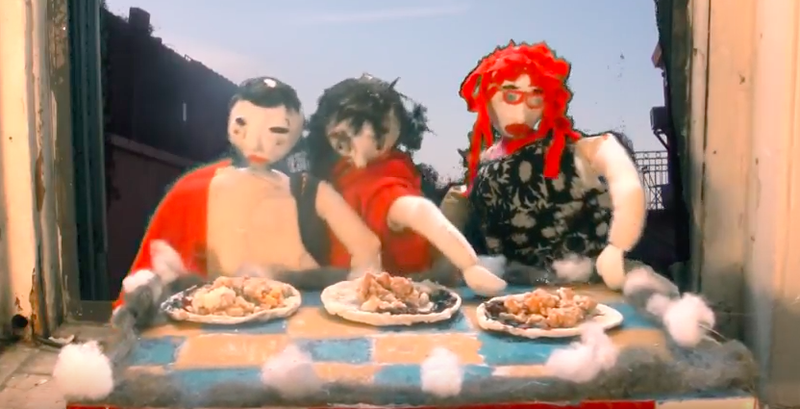 The “She Feels That Way” video shares this quality thanks to Lily’s collaboration with a visual artist in their first attempt to make and manipulate puppets. After making the puppets, Ani worked alongside Lily to develop the dressing, filming and set design over the course of a few chaotic days. If this approach sounds familiar it’s because it mirrors Palberta’s impulse to play and transmits it to an unfamiliar medium. Palberta thrives among the unknown and “She Feels That Way” testifies to their rare ability to be themselves at whatever they try their hand at. Palberta's Bye Bye Berta is out now via Wharf Cat and Ramp Local. The band will be on tour this summer with Palm. Check out the dates below.